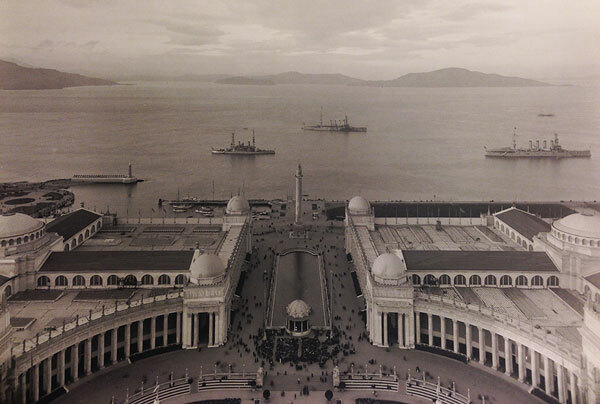 When the Panama-Pacific International Exposition opened in 1915, San Francisco looked fabulous: Bedecked with ornate, European-inspired architecture and an array of technological wizardry, the city resumed its role as a West Coast powerhouse less than a decade after near-total destruction. Block after block of property flattened by the 1906 earthquake and ensuing fires had been transformed to make way for glitzy new hotels, sturdy apartment buildings, landscaped parks and courtyards, offices, theaters, and a sparkling, gold-topped City Hall. New streetcar lines were built to carry visitors and locals to the fair, much of which rose on previously uninhabitable lots along the city’s northern waterfront. 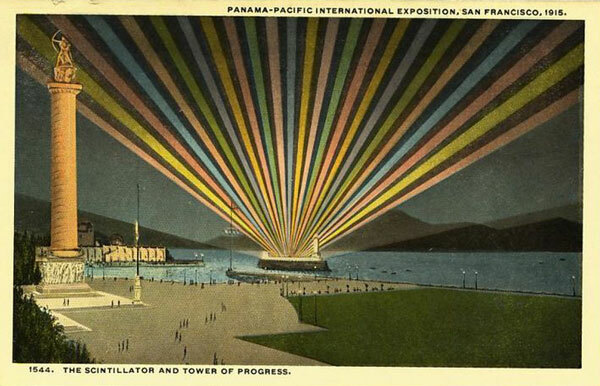 The Panama-Pacific International Exposition showed the world that the city had reached new heights of grandeur, launching the modern incarnation of San Francisco like a phoenix from the ashes. 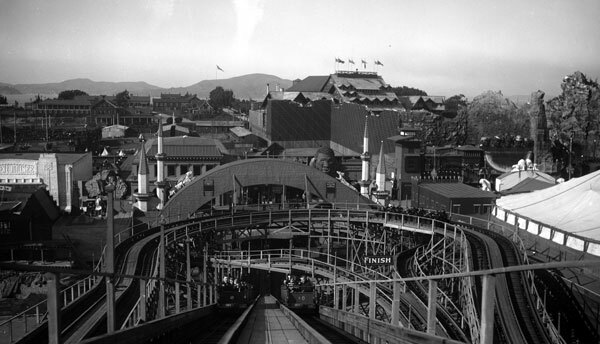 The concept of a world’s fair wasn’t new to San Francisco, as several exhibitions had been proposed during the late 19th century. 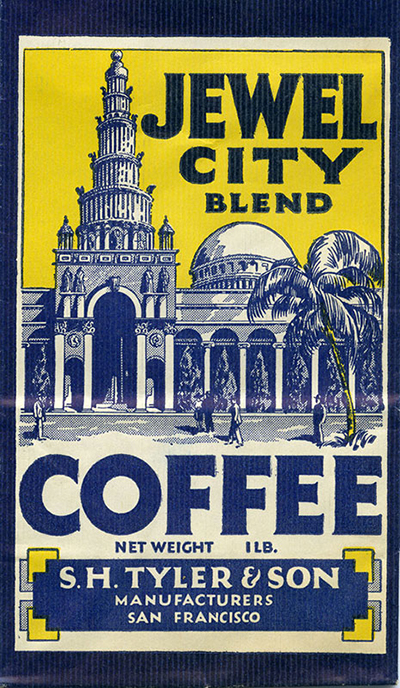 In 1894, the city hosted the California Midwinter Exposition, which brought many of exhibits from the Chicago Columbian Exposition to the West Coast. 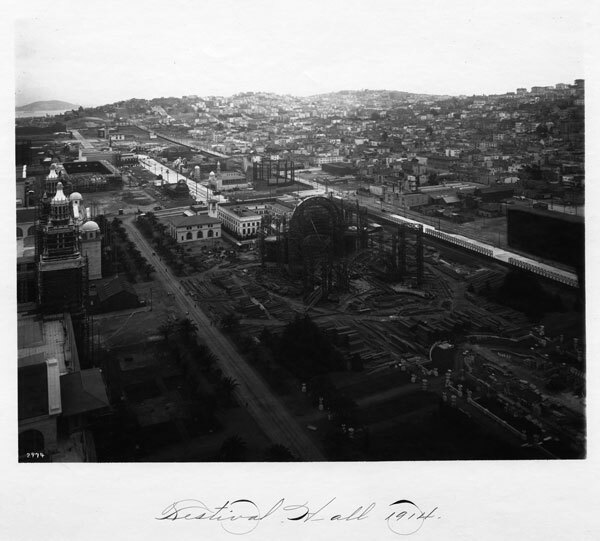 Then in 1909, a few years after the city’s devastating earthquake, the Portolá Festival provided the community its first opportunity to show that San Francisco was getting back on her feet. 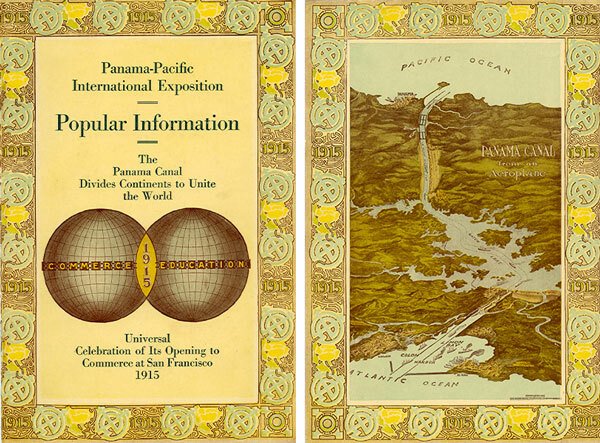 But the Panama-Pacific International Exposition (PPIE) of 1915, an idea that had been forming since the 1890s, finally put a global spotlight on the city, as it celebrated the Panama Canal’s completion and its impact on travel and trade throughout the Western Hemisphere. Top: A colorful view of the fair by night. Courtesy Laura Ackley. 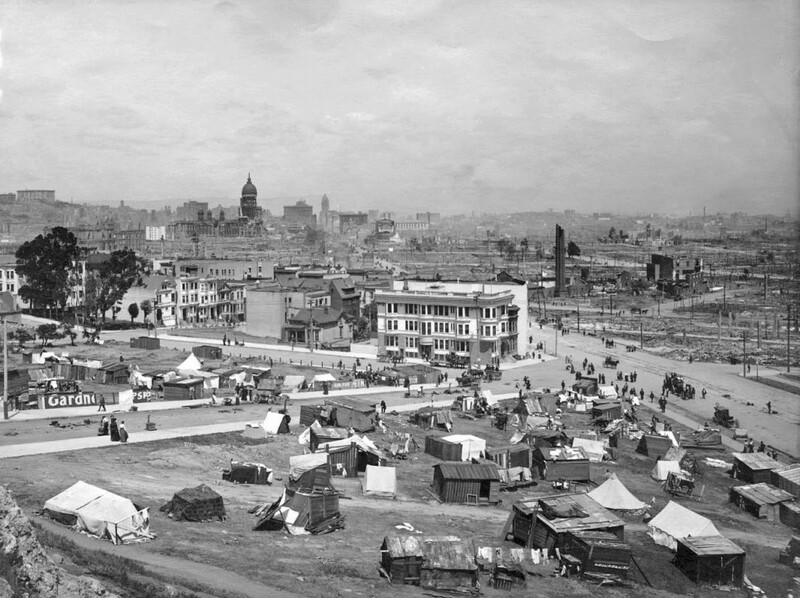 Above: A makeshift refugee camp on a hillside above Market Street in 1906, looking toward downtown San Francisco and the burned-out dome of the original City Hall. 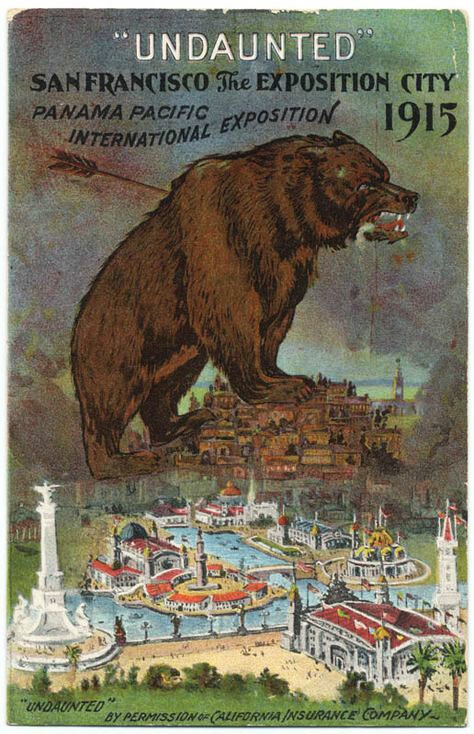 Postcards such as this one were part of San Francisco’s campaign to host the 1915 world’s fair. 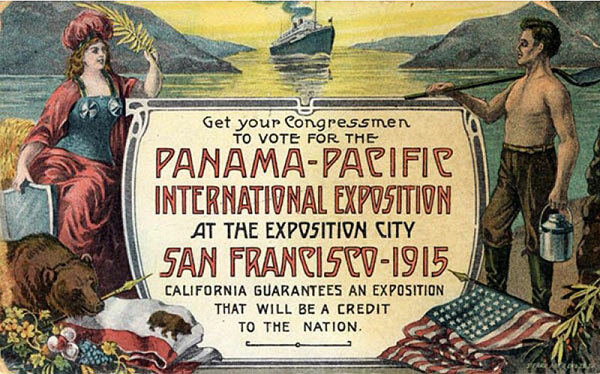 Before San Francisco could plan its fair around the opening of the Panama Canal, the city had to win popular support over other municipalities, particularly New Orleans and San Diego. The Portolá Festival helped prove that the city was ready for an influx of guests, and since the bulk of California’s population resided in the northern portion of the state, San Diego was easily bested. 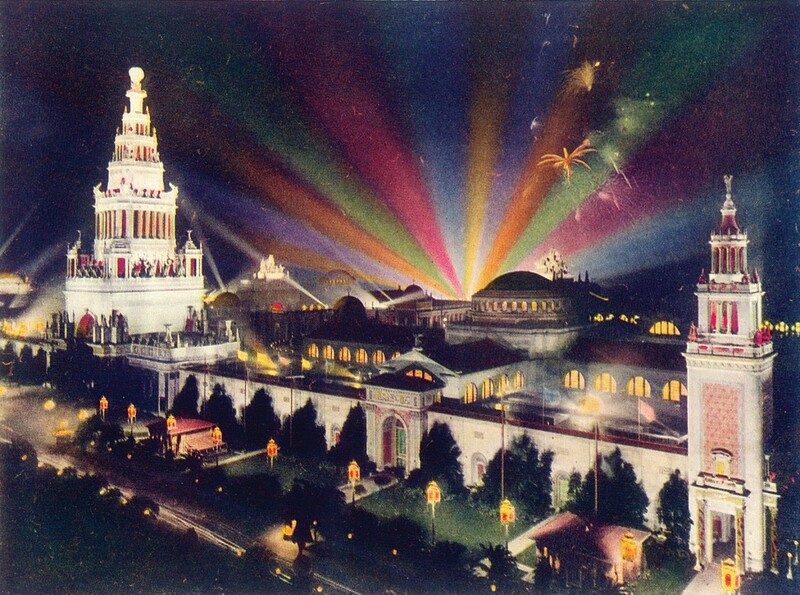 (San Diego was eventually provided state funds to produce the much-smaller but similarly titled Panama-California Exposition, which also debuted in 1915 and offered visitors enticement to see more of the Golden State.) New Orleans took the fight to Congress in 1911, but San Francisco’s fundraising powers and the support of President Taft helped the city by the bay win federal approval. On the ground in San Francisco, a group of influential locals had formed the PPIE board of directors, putting their financial power behind the world’s-fair pitch. “You had this coalition of businessman and politicians, including congressman Julius Kahn, Mayor James Rolph, Charles C. Moore, and others that are all working their angles to make the giant undertaking a reality,” explains Ackley. Moore, the businessman who convinced nine countries to send representative ships for the Portolá Festival in 1909, was appointed president of the fair by the board. To pay for this massive undertaking, California voted to institute a new statewide tax and San Francisco established a citywide bond, both of which added to the primary funds raised by selling PPIE stock subscriptions. 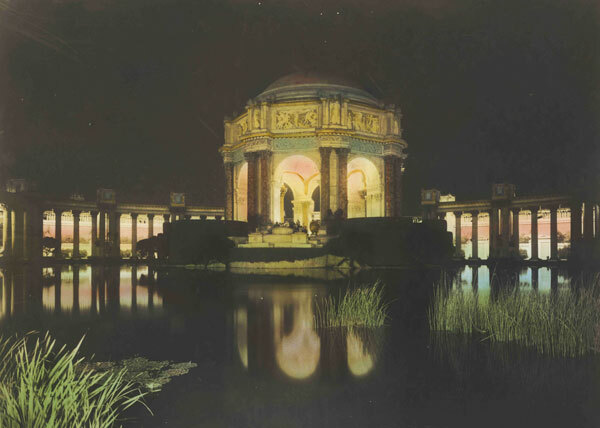 The PPIE board eliminated potential sites at Golden Gate Park and Lake Merced for being too destructive and costly, settling on a marshy plot bordering the Presidio near the mouth of the San Francisco Bay. Known today as the Marina, at the time the neighborhood was a sparsely populated area called Harbor View, which encompassed more than 400 existing properties and a 71-acre tidal lagoon. The lagoon was filled, utilities were extended, and the owners of existing buildings onsite were compensated so they could be moved or demolished. 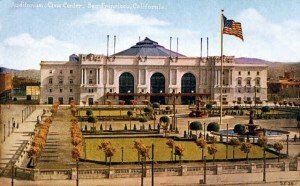 A postcard view of Civic Center Plaza and the Exposition Auditorium, designed as a permanent gift to San Francisco. 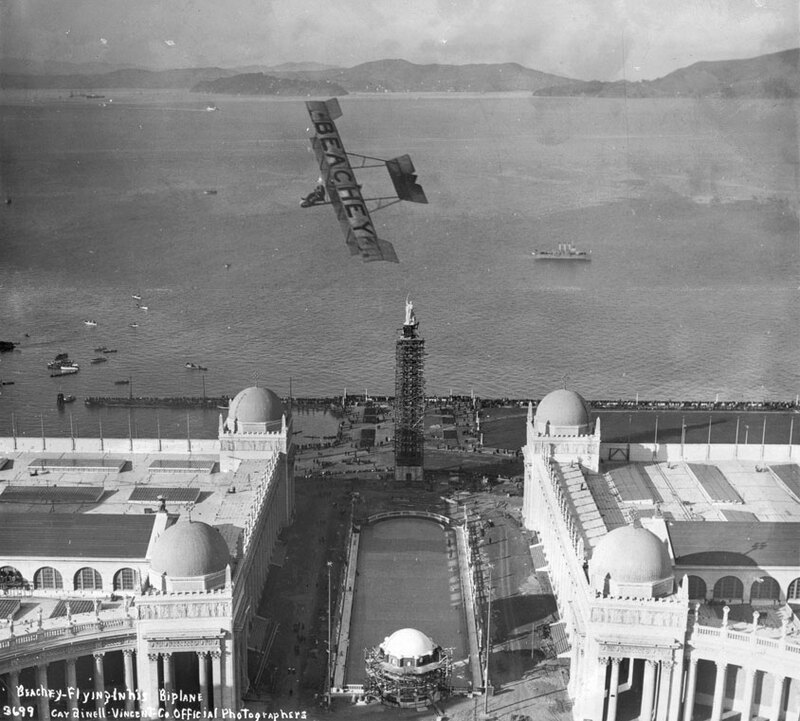 By the time of the fair’s opening in February of 1915, most evidence of San Francisco’s great earthquake was gone. The gorgeous new City Hall was nearly finished along with the broad Civic Center plaza and Exposition Auditorium (known today as the Bill Graham Civic Auditorium), which was one of the few PPIE buildings constructed as a permanent gift to the city. The Parisian proportions of San Francisco’s new Civic Center were some of the few elements that survived from architect Daniel Burnham’s 1906 master plan for San Francisco, which was completed just a few months before the city burned to the ground; most of the broad boulevards, parks, and classical public buildings set forth in Burnham’s proposal were scrapped during the initial rush to rebuild. Inside one of the unfinished palaces, an oversized sculpture group called “Nations of the East” awaits installation over the Arch of the Rising Sun behind a crowd previewing the fairgrounds. Most of the 1906 damage was due to fires that spread quickly through downtown, hence the PPIE organizers were especially worried about preventing conflagrations at the fair. “That was actually one of the deciding factors for Harbor View, the proximity to the bay made it easier to defend against fire,” says Ackley. “In addition, the exposition had an elaborate fire alarm system including a complete, dedicated fire department and a system of ‘Aero Alarms.’ Each used wire tubing containing air that would expand and trip a signal if it got too hot. They were so sensitive that just before the fair opened, one alarm was triggered by a lamp placed too near to one of the tubes.” The fair built three onsite firehouses to work in conjunction with closely spaced hydrants, an automated sprinkler system, and two fireboats. Yet as the exposition was gaining momentum, growing hostilities in Europe were also leading to World War I, forcing countries like Britain and Germany to withdraw from the PPIE. Even countries that didn’t participate in the war had to deal with trade routes that were limited or cut off entirely, restricting important materials and goods from reaching California. Regardless, the organizers pushed on, securing the participation of 31 different countries, including France and Japan, plus hundreds of other exhibitors and concessions. When the PPIE finally opened, it was a microcosm of the world—a dazzling expanse of monumental architecture filled with new technologies, products, and international cultural exports designed to make any guest swoon. And swoon they did: After entering through an opening in the oversized hedge wall facing Chestnut Street, visitors wandered past the domed Horticulture Palace and its elaborately landscaped gardens, passing under the Tower of Jewels to enter the Court of the Universe. Built in a grid surrounding this central court were eight primary palaces devoted to food products, agriculture, transportation, mines and metallurgy, education and social economy, liberal arts, manufacturers, and varied industries. At the far western edge of this grouping, the Palace of Fine Arts curved around its giant lagoon; behind it rose pavilions dedicated to particular nations and various athletic fields. To the east was the Palace of Machinery and the Joy Zone beyond, with its rowdier amusement corridor. 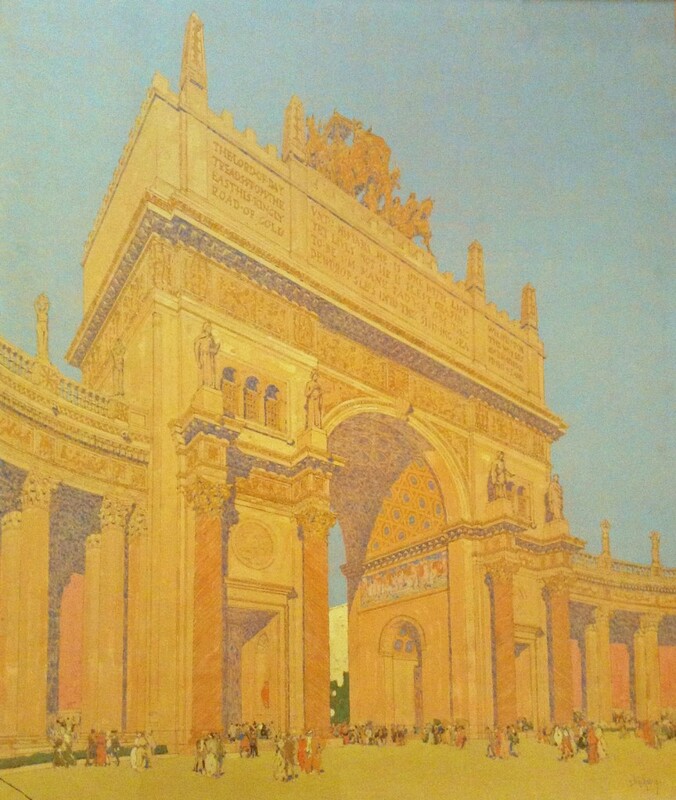 Jules Guérin painted this view of the Arch of the Rising Sun in 1913 to illustrate the building’s California color scheme. Via the San Francisco Public Library. All these structures and their lushly landscaped courtyards were united by an earth-tone color scheme devised by muralist Jules Guérin, the Director of Color, to reflect the California landscape. “I saw the vibrant tints of the native wild flowers, the soft brown of the surrounding hills, the gold of the orangeries, the blue of the sea; and I determined that, just as a musician builds his symphony around a motif or chord, so must I strike a chord of color and build my symphony on this,” Guérin wrote. 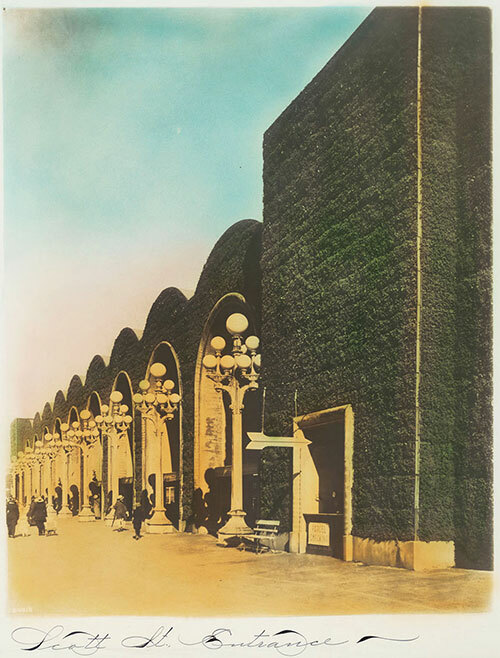 Architect Bernard Maybeck, who designed the Palace of Fine Arts, likened the entire assemblage to a cloissoné brooch, with its many Italianate, Islamic, and French-inspired buildings all clad in faux-travertine. Glass Novagems like these adorned the Tower of Jewels and were sold as souvenirs of the PPIE. 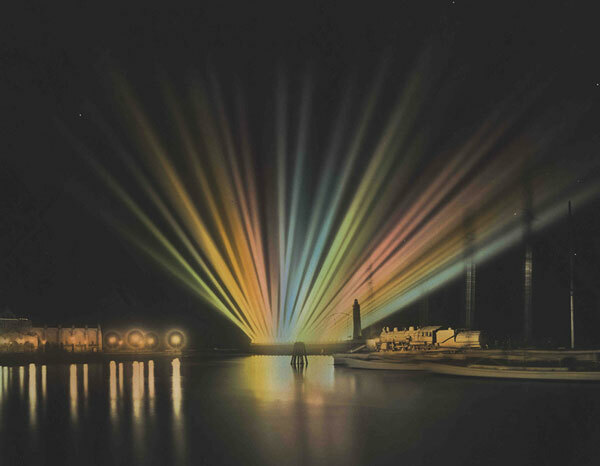 Ryan had previously worked as director of the Illuminating Engineering Laboratory for General Electric, and was keen to try out some of new tricks for the PPIE’s groundbreaking Total Illumination Plan. 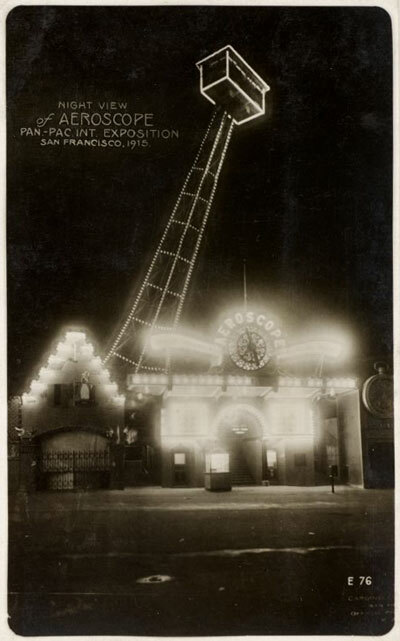 The commonplace method of outline lighting, or using individual incandescent bulbs to trace a building’s major features, was on display at San Francisco’s Ferry Building and some of the campy Joy Zone concessions but not within the grounds of the PPIE. 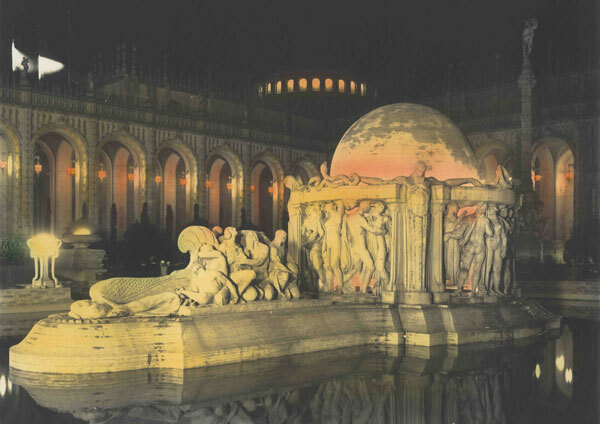 Instead, Ryan developed several innovative techniques to provide subtle, indirect, and colorful lighting that made the exposition spectacular at night. In the Court of the Universe, Ryan concealed 1,500-watt lamps inside the decorative glass columns rising from the two central fountains—by day they appeared to be sculpted from marble but at night they transformed into bright beams of light. In the Court of Abundance, real flames burned in the mouths of sculpted snakes, while an 18-foot glass sphere in the Fountain of Earth utilized carefully placed interior lighting to imitate the effect of a massive rotating globe. Inside the Palace of Horticulture’s glass dome, the so-called Electric Kaleidoscope projected images of blazing comets, fading sunsets, and fluttering spots resembling butterflies, waving ribbons, and other amorphous shapes. Throughout the grounds, the evening ambience was manipulated with carefully placed spotlights, softly glowing flames held aloft by statues, and bulbs concealed behind banners and other architectural details. Though tickets to this wonderland weren’t cheap, they were affordable enough that most residents could save up for at least one day at the fair. “I think it was accessible to most people,” says Garcia. “Daily admission was 50 cents, and I did a little calculation online, and that comes to about $11 a day in 2015 dollars. You could also buy a season ticket book for $10, and that’s a little more than $200 today. It was expensive, but not astronomical.” Additionally, many schools, municipalities, and other civic organizations hosted days where their members or students received discounted admissions. The PPIE also hosted a variety of wackier architectural experiments, such as the Oregon state building, designed as a log-cabin version of the columned Parthenon. Improvements in stucco technology allowed for the construction of several oversized facades along the Joy Zone, such as booths in the shape of gigantic Aztec temples, King Neptune, a Golden Buddha, toy soldiers, elephants, icebergs, and more. 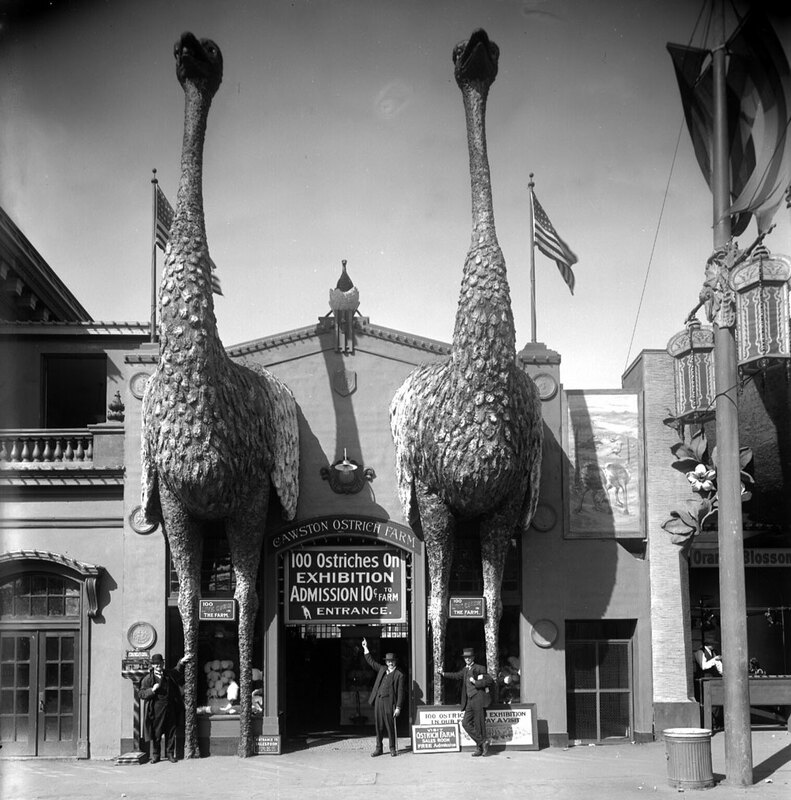 Many buildings along the Joy Zone used programmatic architecture, like these oversized ostriches, to attract potential customers. Courtesy the Seligman Family Foundation. If the fair’s built environment didn’t wow you on its own, there were plenty of exhibits to knock your socks off. There was a giant upside-down potato bug you entered to learn about the wonders of California Spray-Chemical Company’s pesticides, and a huge 14-ton Underwood typewriter that typed onto sheets of paper 9-feet wide. On the Joy Zone, you could watch hundreds of premature incubator babies being cared for by uniformed nurses or take a simulated ride over 100 miles of Arizona’s Grand Canyon. Inside the Pennsylvania building, one could see the original Liberty Bell, which had traveled to San Francisco via train—the final journey of its kind. The Heinz tower was made from 57 tiers of the company’s condiment products. Visitors who got hungry while wandering the grounds could dine on foods from all over the world. “They gave away a lot of free samples at the Palace of Food Products, so many that it became known as the ‘Palace of Nibbling Arts.’ One could easily have a full meal just by sampling everything,” says Ackley. 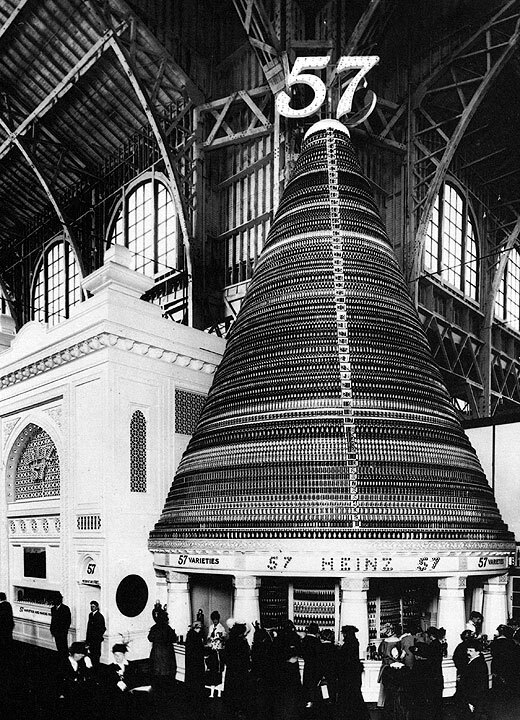 One of the more ostentations edible exhibits was the 57-tier conical tower built from the Heinz company’s sauce bottles, with one layer for each of their famous varieties. In the Fine Arts building, guests were wowed by celebrity painters like John Singer Sargent, James McNeill Whistler, and Edvard Munch, and shocked at the contemporary work of the Italian Futurists. 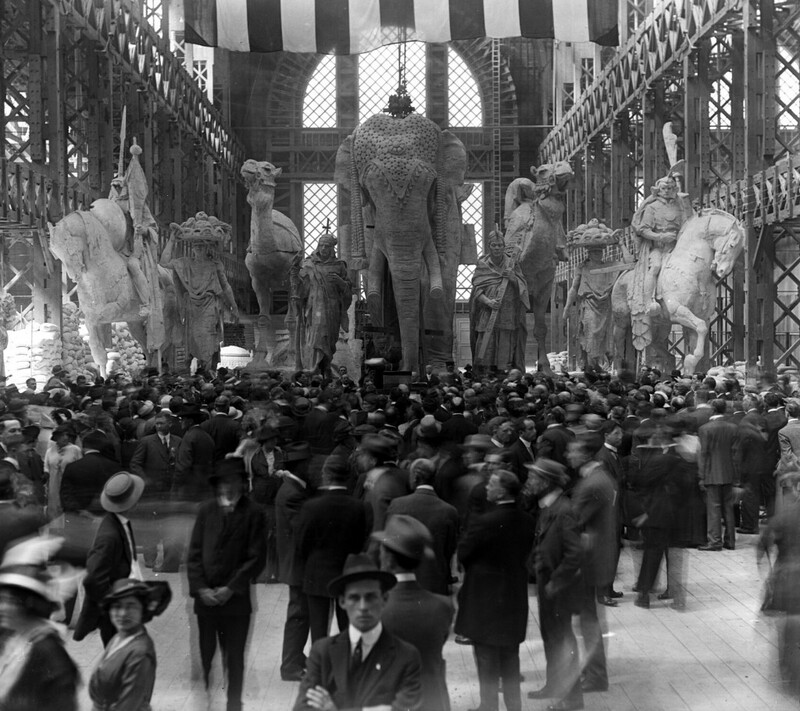 “One of the few positive effects of the war, at least from the exposition’s point of view, was that treasures that would never have been allowed to leave Europe were shown in the Palace of Fine Arts and some of the national pavilions, particularly that of France, because their owners wanted to get them to safety out of Europe,” says Ackley. Exhibitions like Venice’s 1914 Biennale had been cancelled entirely, meaning that artworks and antiquities intended for display elsewhere were free to travel on to San Francisco. The PPIE also hosted top-tier conductors like Camille Saint-Saëns and John Philip Sousa, who performed pieces written for the fair, and renowned modern dancers such as La Loie Fuller’s troupe resembling human-sized butterflies in their elaborate silk costumes. In the 3,782-seat Festival Hall, audiences could hear the famous organ virtuoso, Edwin H. Lemare, play the world’s seventh-largest organ, Opus 500 (which was later moved to the Exposition Auditorium after the fair closed). Great crowds attended speeches by former Secretary of State William Jennings Bryan and former President Teddy Roosevelt, who passionately extolled their opposing views of the war in Europe. 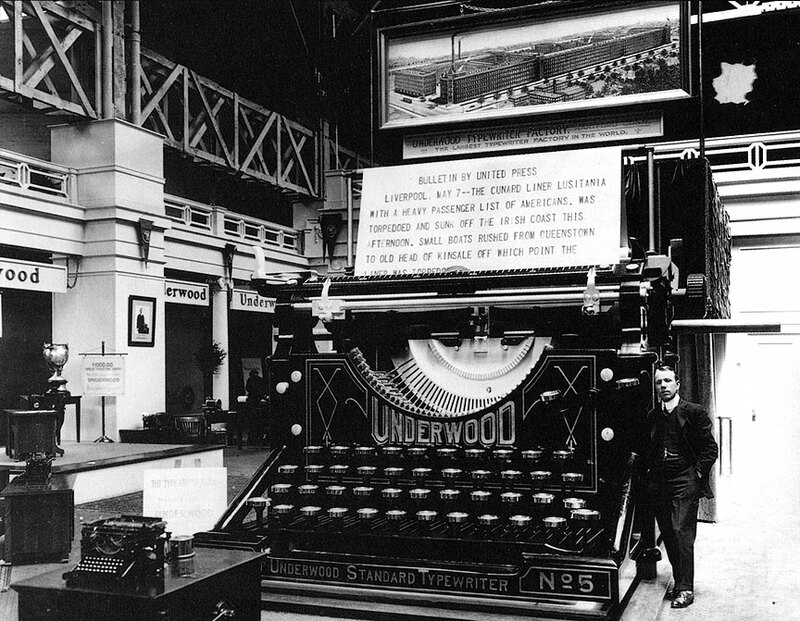 The gigantic Underwood on display in the Palace of Liberal Arts was operated using an ordinary-sized typewriter. Like most major world’s fairs, the PPIE included several booths dedicated to foreign cultures that exotified and stereotyped these races more than they celebrated them. Sid Grauman, of Grauman’s Chinese Theater in Hollywood, presented an offensive attraction called Underground Chinatown. For many visitors, the most thrilling displays were those centering on futuristic technologies. In 1915, only around 10 percent of American homes had electricity, and the PPIE presented a variety of novel electric devices that would quickly become ordinary. “The G.E. home Electrical Exhibit in the Manufacturers Palace had a California-style bungalow filled with all types of different electronics like blenders, an intercom system, a hair dryer, and even an electric car charging station, which I think is really ironic,” says Garcia. Mere months before the PPIE opened, the country’s first transcontinental phone line had been completed, and on January 25th, 1915, in a ceremony designed to gain publicity for the PPIE, Alexander Graham Bell called and spoke from New York to his assistant Thomas A. Watson in San Francisco. Left, the General Electric “Home Electrical” exhibit was designed as a modern California residence. Courtesy Laura Ackley. Right, the kitchen of G.E.’s exhibit featured novel electric appliances including an electric kettle, fan, and stovetop. Courtesy Donna Ewald Huggins. Aviator Lincoln Beachey performing in his biplane over the fairgrounds in 1913, before the official opening. Beachey was later killed during an air show at the PPIE when his plane crashed into the San Francisco Bay. Via the SFO Museum. 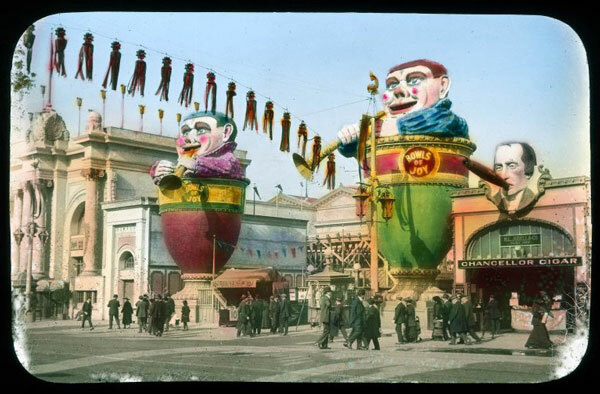 The fair ran for a little over 9 months, closing on December 4th, 1915, with a total of 18,876,438 visitors—far exceeding even the most optimistic predictions. “About $45 million went into the economy of the state, and around $12 million was spent inside the exposition, which is about $565 million in 2012 dollars,” Ackley says. Demolition began almost immediately, since by contract, most of the land had to be returned to its original owners. 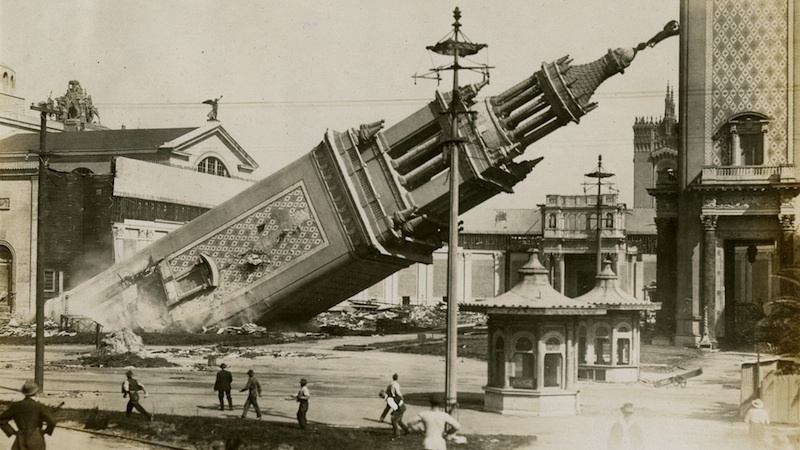 One of the Italian Towers collapsing during demolition of the PPIE in 1916. Though many magnificent structures were destroyed, a campaign to save the Palace of Fine Arts had begun even before the PPIE closed. “Bernard Maybeck’s Palace of Fine Arts was just considered such a masterpiece—the building spoke to people—and they didn’t want to see it demolished,” says Garcia. “They even held a special day where 75 percent of the admission receipts went to its preservation and upkeep after the fair closed.” The Hearst family provided significant funds and support for maintaining the structure, and though its crumbling edifice required a complete reconstruction in the 1960s, San Franciscans still cherish the building today. The Legion of Honor, an art museum given to the city by Alma de Bretteville Spreckels, is another architectural legacy remaining from the fair. 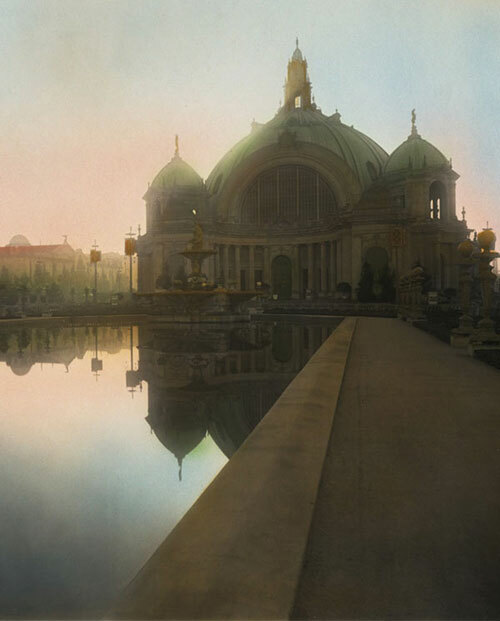 Spreckels fell in love with France’s contribution to the PPIE, and after the fair ended, she commissioned a new museum as a three-quarter scaled adaptation of the French pavilion, which was itself an homage to the Palais de la Légion d’Honneur in Paris. But due to U.S. involvement in World War I, the Legion of Honor wasn’t completed until 1924, when the fair was already becoming a distant memory. 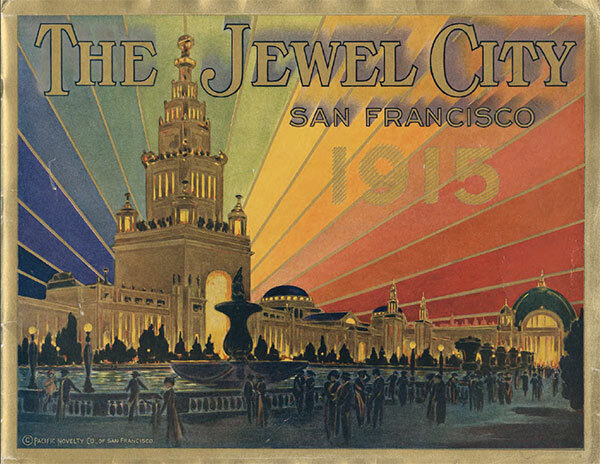 A souvenir brochure showing the Tower of Jewels backlit by the rainbow-hues of the Great Scintillator. 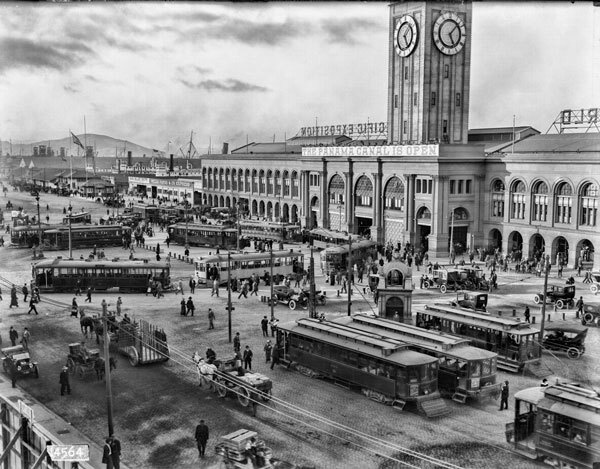 A busy scene on the Embarcadero greeted visitors coming from the San Francisco Ferry Building. Via the SFMTA Archives. Postcards like this emphasized that San Francisco was undaunted by the tragedy of the 1906 earthquake. The PPIE's Festival Hall under construction in 1914 with the city behind it. Courtesy the Seligman Family Foundation. The arched hedge wall of the Scott Street entrance at the PPIE. Via the San Francisco Public Library. 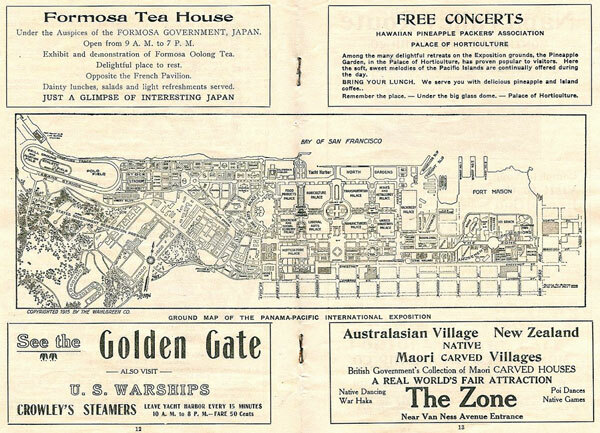 A map of the PPIE from an Official Program given out on June 22, 1915. 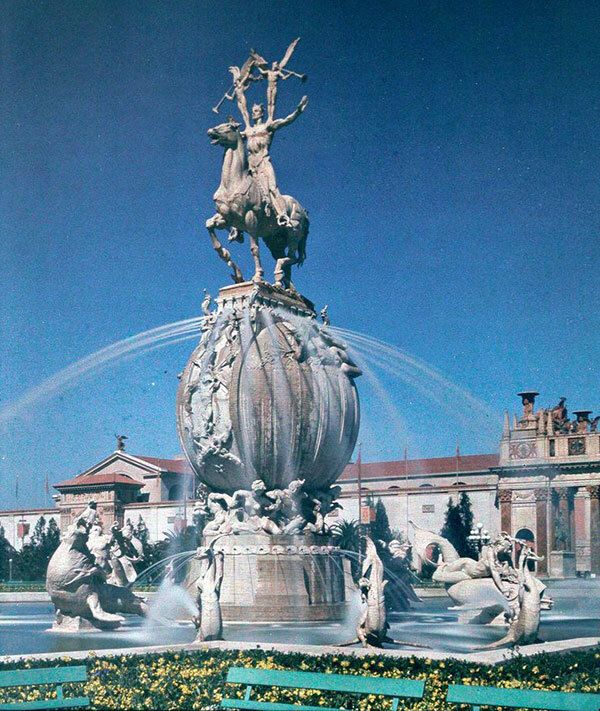 The Fountain of Energy greeted visitors upon entering the South Gardens. Via the Smithsonian. Looking over the Joy Zone from a wooden roller coaster ride. Courtesy the Seligman Family Foundation. 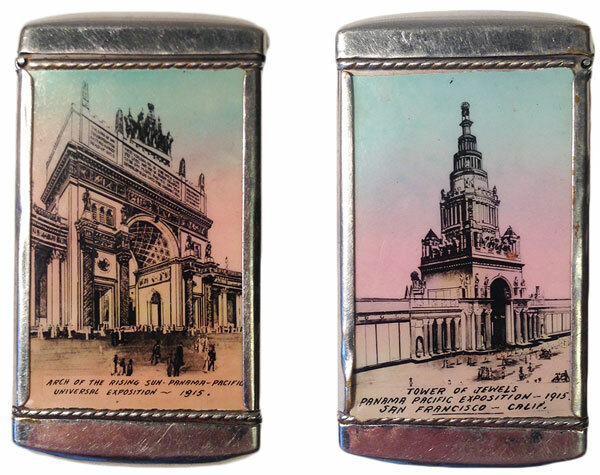 A souvenir matchsafe showing buildings of the PPIE. Courtesy the Seligman Family Foundation. More oversized facades on the Joy Zone. Courtesy the UC Santa Cruz Special Collections. 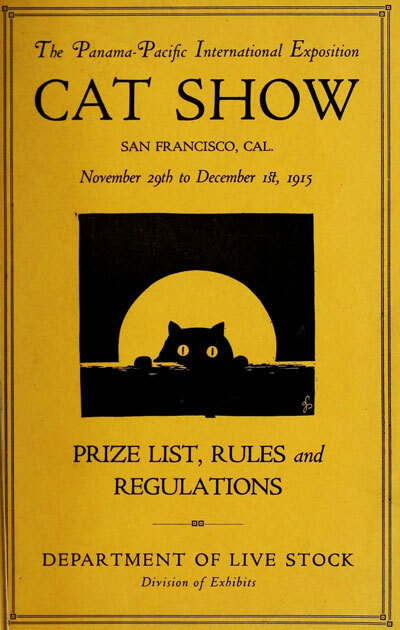 A brochure from the PPIE's Cat Show, one of the fair's more mundane events. 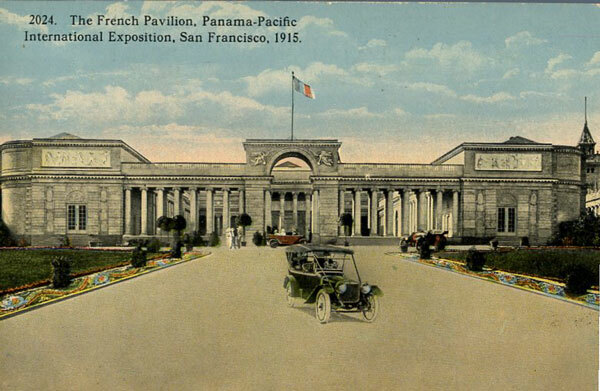 The French pavilion provided the inspiration for the permanent Legion of Honor Museum in San Francisco's Lincoln Park. 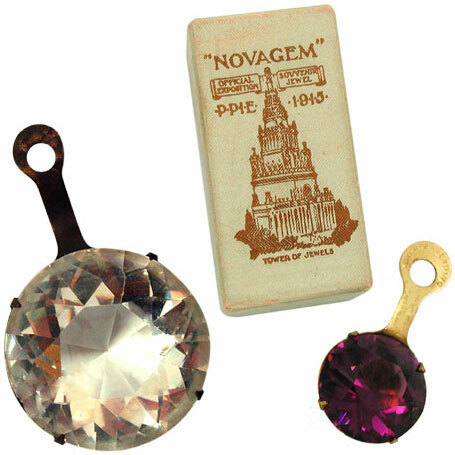 A set of souvenir cut-glass "Novagems" identical to those that hung on the Tower of Jewels. Courtesy the Seligman Family Foundation. A PPIE brochure with facts about the Panama Canal. Courtesy the Seligman Family Foundation. Many companies used the PPIE as an opportunity to boost sales, seen here on a S.H. Tyler & Son coffee bag. Courtesy the Seligman Family Foundation. 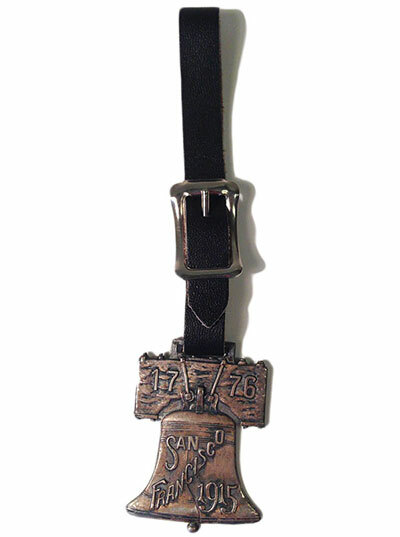 A PPIE watch fob in the shape of the Liberty Bell. Courtesy the Seligman Family Foundation. 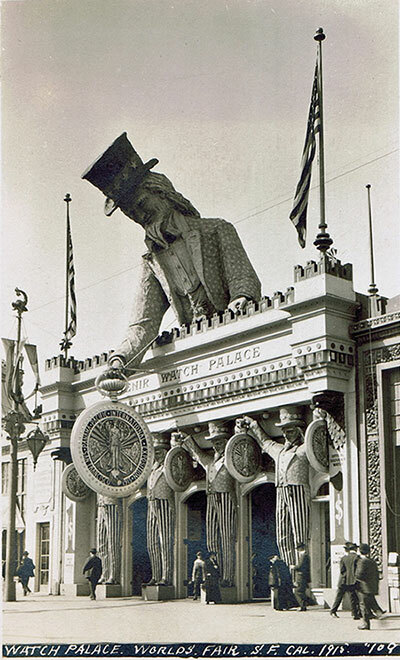 A looming Uncle Sam greeted guests with a huge pocket watch at the Souvenir Watch Palace. An aerial view from the Court of Universe looking out to the San Francisco Bay. Courtesy the Seligman Family Foundation. The PPIE's Festival Hall seen at dusk. The entrance to the Scenic Railway attraction on the Joy Zone. 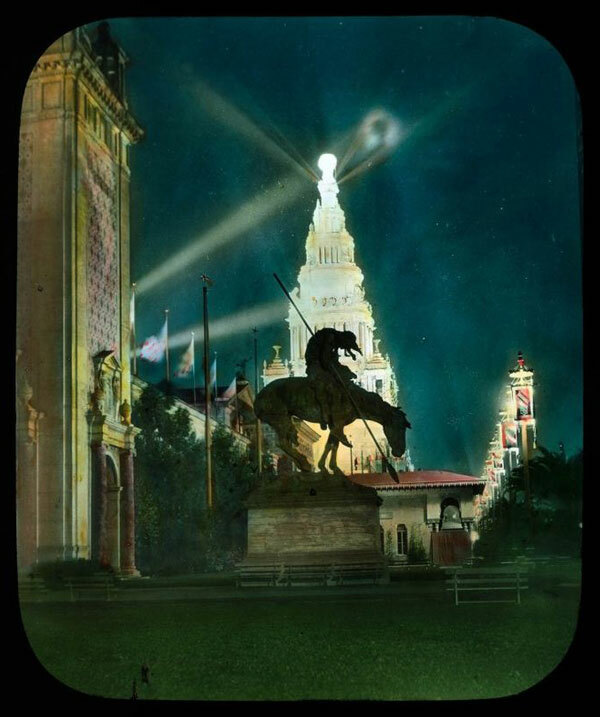 A postcard showing the Great Scintillator shining behind the Tower of Progress. The Aeroscope ride on the Joy Zone. The Fountain of Earth featured a massive glass globe that seemed to rotate using interior lighting. Courtesy the Seligman Family Foundation. The Tower of Jewels rises behind James Earle Fraser's famous statue "End of the Trail." Courtesy the UC Santa Cruz Special Collections. A closer view of the Great Scintillator and the stationary locomotive used to create steam and smoke. Courtesy the Seligman Family Foundation. The Palace of Fine Arts under nighttime illumination. Courtesy the Seligman Family Foundation. 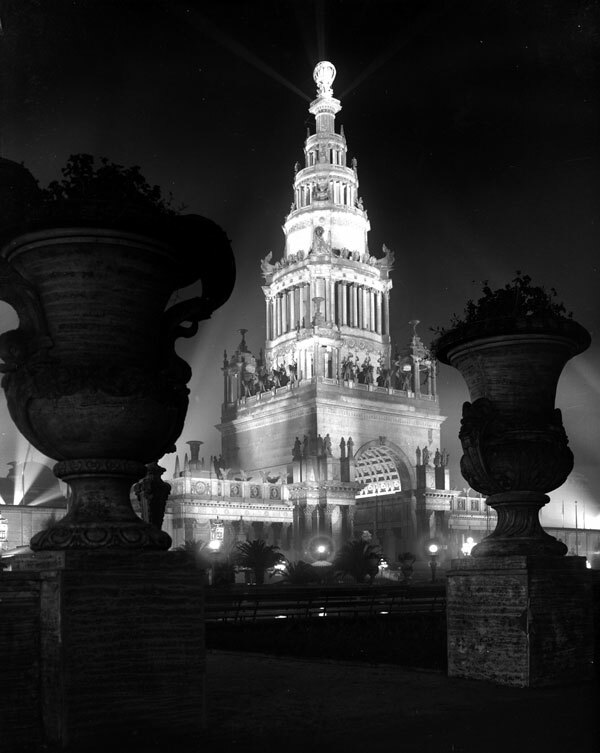 The Tower of Jewels viewed from the South Gardens at night. Courtesy the Seligman Family Foundation. An excellent article, along with the photos, and recently I read an article of Before and After of the same worlds fair with photos…as to what is there now. Thank you so much for this article. 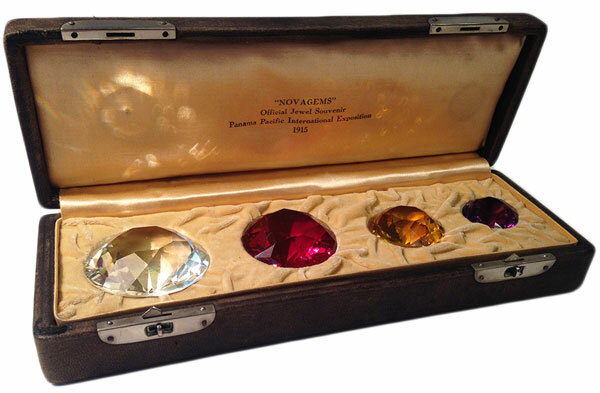 My grandma gave me one of the “diamond” Novagems and I did some research to find out what it was and where it came from. This article gave me so much background information. 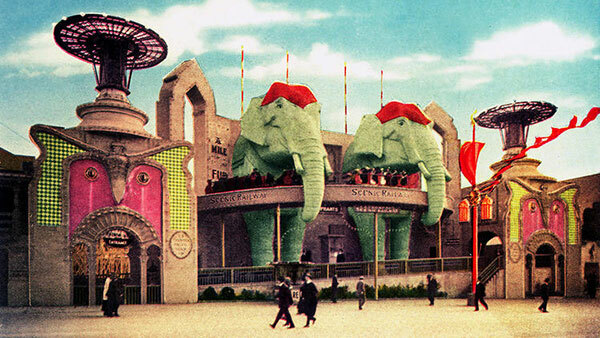 It would have been just incredible to attend that worlds fair. Thanks again!!! Hmmmm I wouldn’t say people don’t think of Los Angeles as a world city.. it’s considered an alpha world city which brings it to par with Madrid, Sydney, México City, Moscow, Toronto, Seoul, Chicago, Frankfurt, etc. San Francisco, having lost its crown as the premiere city on the west coast to LA, is now considered an alpha – (minus) world city such as Barcelona, Melbourne, Miami, Taipei, Tel Aviv, Manila, Luxembourg. I think that the writer is just being biased, of course they’re gonna take the side of SF. With that aside. I think it’s very unfortunate that all of this had to be demolished. How is it that San Diego got to preserve almost 100% of its exposition buildings in Balboa Park which still stand today? As far as I know they were built to be temporary as well but the residents and visitors fought to keep them up. If San Francisco had these buildings still standing, I think without a doubt it would’ve never lost its spotlight to Los Angeles with its glitz and glamour of Hollywood. “ ” I had things like 'Annie' curlers hanging on the wall—just crazy, weird toys all over the place.